Customised lifting solution with VacuCobra vacuum lifter installed on a Lyftman articulated jib arm that has been mounted on a fork lifter. This special lifting solution is used by the operators to load and unload various goods from pallets. The fork lifter unit provides great mobility which makes it ideal when the operator needs to be able to move around on a larger area. 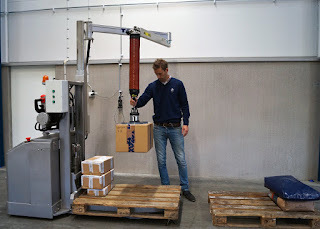 The height of the column is adjustable and the lifter has multiple integrated safety features, as demonstrated in the video below. 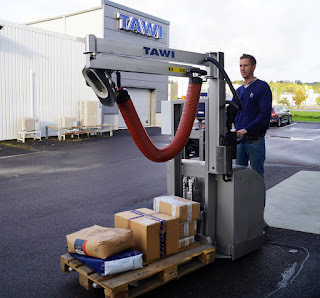 The VacuCobra vacuum lifter is ergonomically designed for high speed lifting of goods up to 50 kg. The VacuCobra is mounted on a Lyftman articulated jib arm that offers great flexibility and free rotation of lightweight goods.